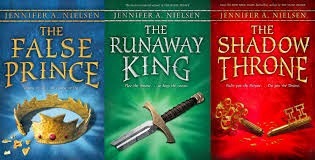 Bookshop Talk: ***Giveaway*** The ASCENDANCE TRILOGY by Jennifer A. Nielsen! ***Giveaway*** The ASCENDANCE TRILOGY by Jennifer A. Nielsen! Sage was pretty awesome. He was so clever, and rather attractive as well. I could read scene after scene of Sage’s inner monologue, and be satisfied. There is no way I can possibly praise the book enough. It begins excitingly, and only gets better from there. Nielsen gives just enough information to keep the reader on the edge of their seat, and it is so much fun to unravel the many mysteries entwined and surrounding each other. How could I help but want to read THE FALSE PRINCE, right? Well, my friends, I didn’t just read it, I devoured it. And I was so instantly in love that it was nearly painful to wait even just a couple more months from that point for the second book in the Ascendance Trilogy, THE RUNAWAY KING. And this book, this book also blew me away, but even more so. There was more, more, more of what I loved in the first book. An even stronger plot, a heightened romance (I’m a sucker for that, you know), more action done to perfection (seriously, read it and you’ll agree), and more of a hero so enjoyable, I truly wish he was an actual friend because he definitely feels like one (but I’ll admit that I’d probably stalk him and make him say clever things to me all day. And I might embarrass myself due to a little crush as well). So, knowing that this was a three-book series, I was dyyyying to get my hands on THE SHADOW THRONE. Let’s just say that once the advanced reading copies were available, and I wasn’t able to get one in a more straight forward way, I resorted to taking advantage of an editor friend—a horrible thing to do, but I was desperate—who then contacted Jennifer A. Nielsen’s editor . . . and alas, my manipulative, lying, cheating, stealing, and wicked ways finally paid off (I wasn’t really that diabolical, but this version of the story more accurately explains how eager I was to read it). And it was AWESOME!! It whipped me around in ways I couldn’t have imagined . . . emotionally, physically, intellectually. And the series ended in an exceptionally satisfying way (except that I still want more! So in that way, I guess I’m not satisfied at all). I read a heck of a lot, but the honest truth is, I can name on just one hand how many series I’ve felt have gotten better with each book. Most often, I love the first book, then the second usually feels like filler, and the third doesn’t live up to the expectations the first sets up. And it’s sometimes worse than even that if there’s more than three books in a series. But truly the Ascendance Trilogy gets better with every single book, and THE SHADOW THRONE nails it! So to share the love, and celebrate the launch day of THE SHADOW THRONE, Bookshop Talk is giving away a set of the entire Ascendance Trilogy! All hardcovers. For real! What do you need to do to win? Check out the Rafflecopter giveaway below, and be sure to check back here on March 4th when we announce the winner! Good luck!! The Ascendance Trilogy is truly amazing! One of the few series that attracts middle school aged boys and compels them to read and chat about books! The books are so amazing that all ages and stages in life love it too! Hope we win a boxed set! Can't wait to read The Shadow Throne! I never even knew there were two more books after false prince...gonna need to hunt them down now. This is one series I can't get enough of. Sage is one of my favorite characters ever, and I can't wait to see what he's up to this time around! Sounds like a great series! Definitely adding them to my to-read list! If I had such sneaky ways to get my hands on the last of these books I would fully utilize them. I applaud you and hope for a similar outcome in this giveaway!